The Edinburgh Festival Fringe just grows and grows, doesn’t it? The statistics defy predictions, break records, and every time things look as if they’re about to hit tipping point and collapse, they don’t. It’s a remarkable ecosystem that for a month each year blossoms into a city within a city. Parts of it die off, new bits grow in a relentless expansion fuelled by creative innovation and economic necessity. But it does have to hit a wall at some point, surely? Well not for the foreseeable future, thanks to the festival’s free sector. A closer look at the more than 3,500 shows taking place this August (3,300 in the official programme and at least a couple of hundred more, up by more than 10% on last year) reveals that easily a third of the shows do not follow the standard paid-for model. In the 20 years since the free sector arrived in the form of PBH Free Fringe, the likes of Laughing Horse Free Festival and Freestival have added to the throng, along with the free-ish models of pay-what-you-want, pioneered by Heroes of Fringe, and Forest Fringe. The emergence of the frees was important for the fringe, a necessary response to the culture of rising costs for performers and punters alike that came to be associated with the paid-for venues. With the benefit of hindsight, the reality is that the frees have not made a measurable economic impact on the paid-fors, which have continued to raise both ticket prices and venue charges, despite the fact that the frees continue to charge a minimum to performers. The result is a genuine return to the open playing field, that original fringe spirit of access for all. That’s a good thing but the price paid by Edinburgh is the sight of two mighty camps who acknowledge each other’s existence but ideologically remain aloof, in a similar way to an earlier split in the paid-fors when the biggest venues banded together to produce their own programme. If we’re honest about it, the expansion of the frees has demonstrated that there’s so much unclaimed territory across Edinburgh that they can choose to engage or not with their paid-for peers. The cultural difference became evident two years ago when there were no Big Four acts among the Foster’s Comedy Awards award winners, which included Heroes of Fringe’s Adrienne Truscott and PBH Free Fringe’s John Kearns, who won best newcomer, stuck with the free and then went on to win the main award the following year. But where do performers like this go from here? The ideological, economic and geographical separation in the system works against developing a bridge between the frees and paid-fors, pinning performers on either side of the divide. The free festivals’ anarchic protest has created an established vibrant, creative environment, but it is not designed to help artists make an easy move to the paid-fors – as most must do if they want to increase their audience, and earn a living. For a lot of performers this can be a tricky transition. True to the organic nature of Edinburgh, a solution has popped up in the shape of pay-what-you-want (PWYW), the small but perfectly formed hybrid that has emerged from the frees. Heresy to the frees, baffling to the paid-fors, it takes elements from both free and paid-for, PWYW shows are free with a bucket at the end, but you can buy tickets in advance to guarantee a place. It is significant that its champion, Heroes of Fringe’s Bob Slayer, evolved the model in order to address another imbalance in the system, in which the big comedy promoters dictate who gets to see what in the paid-for venues and, in so doing, have priced out the smaller acts. PWYW, therefore, can go places where free can’t. No one denies that free is an attractive model, but its strengths are also its limitations. The big venues have flirted with free and it hasn’t worked for them, yet a model is still needed to get things flowing between the frees and the paid-fors, to provide freedom of movement for performers. If there’s a model that the paid-fors can use to make the fringe a more interesting and fairer place, then we should all welcome it. What works for both camps can only be good for the performers and increase their professional opportunities. So, when it started at Edinburgh with Heroes of Fringe, the paid-for venues eyed PWYW with great interest since the system can be readily adapted for different environments. PWYW offers venues a platform to take on cutting-edge shows with confidence, yet both sides get a fair crack at the income: the dual streams of audience revenue lend themselves to a more equitable split and attractive cashflow. 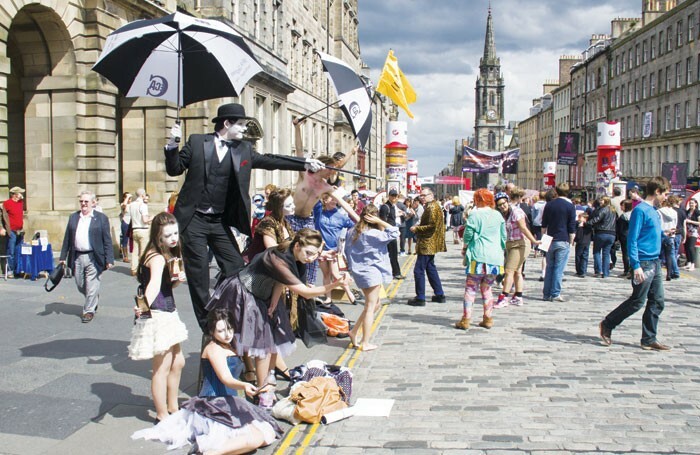 Last year, venues such as Pleasance and Underbelly were actively looking at incorporating PWYW into their programmes, but it came as no surprise that they didn’t commit. Then the turf wars over Cowgatehead happened. PBH Free Fringe and Freestival had a stand-off over rights to stage shows in the building. As a result, the Freestival shows booked there lost their slots. Other venues stepped in to offer homes to the refugees, such as Laughing Horse Free Festival and Just the Tonic, who have already featured free shows for the past five years. This was a real game-changer. The Pleasance now unexpectedly finds itself with six free shows on its roster, rebranded as PWYW. This is the start of a cultural change for theatre in particular. The free and PWYW models were built up on comedy, and for years theatre didn’t get much of a look-in. Thanks to the growth of cabaret and spoken word, theatre has found a new home in the frees and confounded the adage that quality can only come with the purchase of a ticket. But the nature of the frees means that providing theatre-friendly venues will always be a challenge. On the other hand, the record of the paid-fors in reinvesting in their own theatre facilities is lamentable and even paying full whack at a Big Four space gets you not much more than a fraction of what you would have got for the same cost 10 years ago. The pay-what-you-want model offers a vital third way for theatre and is a real chance for performers and companies to get back control, getting the best of both worlds. PWYW combines the ability to fill a room in the same way as a free show with the advantage from the paid model that there is money coming in from tickets. This economy sets the stage for a more equal partnership between performer and venue, where improved spaces, facilities, timeslots and marketing can be negotiated. By assuring value without compromising creativity, PWYW’s spread will be empowering for emerging theatre not only at Edinburgh but nationally.